A few weeks ago, I received a pair of MSP432 Launchpad development boards courtesy of Texas Instruments, and two weeks ago, I began porting ArTICL to the MSP432. I'm happy to announce that ArTICL is now available to MSP432 Launchpad programs. First developed last year as an upgrade to my much-used but unpolished Arduino-TI calculator linking routines, ArTICL offers an easy interface to communicate between TI calculators and microcontroller development boards. ArTICL (which stands for Arduino TI Calculator Link) lets TI-83 Plus, TI-84 Plus, and other TI graphing calculators send and receive numbers, lists, strings, pictures, and other data types by making the Arduino or MSP432 emulate another calculator or a CBL2 device. 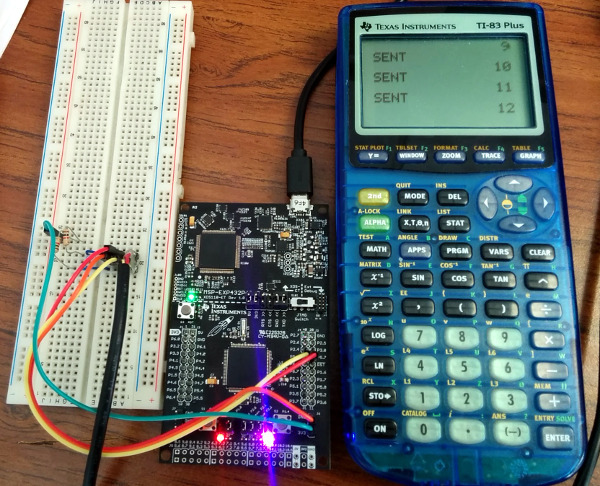 ArTICL also includes five example programs that demonstrate how it can help graphing calculators interface with LEDs, sensors, motors, and more. Four of ArTICL's five demo programs have been made cross-compatible with the MSP432 Launchpad: ControlLED, Screenshot, ReadAnalog, and TypeLetter. ControlLED lets your calculator control the LEDs on the MSP432 Launchpad by sending a one-element list. Screenshot takes a screenshot of the calculator's screen when you press pushbutton P1.0 on the Launchpad, and dumps it as ASCII art to the Launchpad's serial interface. ReadAnalog returns the values of six analog pins on a scale from 0 to 1023 (0v to 3.3v). Finally, TypeLetter sends a remote keypress to the calculator twice a second, instructing it to type 'M' (or any other letter). In preparation for Cemetech's appearance at World Maker Faire 2015, we will be developing more ArTICL + MSP432 Launchpad projects. Time permitting, the Gameboy Camera demo (ArTICam) will be ported, and we'll be creating a new Whack-a-Mole demo that combines a physical play field with a TI-84 Plus C Silver Edition game. If you have an MSP432 Launchpad, please try out ArTICL, and since it's an open source project, feel free to contribute your own examples or bug fixes. © Copyright 2000-2019 Cemetech & Christopher Mitchell :: Page Execution Time: 0.170250 seconds.